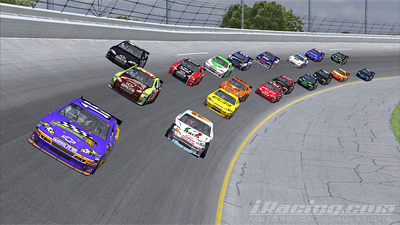 iRacing recently announced some changes for the upcoming 2010 iRacing.com Pro series. The main change sees the number of eligible racers expand from 250 to 350. I think this is a great move – last season we had 250 eligible racers but routinely had less than 50 of them racing each week. It was nowhere near as busy as it should have been. Hopefully the increased driver pool, plus the interest in the Drivers World Championship (the ultimate end goal of the Pro series qualifiers) should mean the 2010 Pro series is better populated. Another main change is the number of qualifying positions available. Now that we have 50 drivers who have progressed to the Drivers World Championship we will see only the top 20 Pro series finishers progressing to the big league (and not the same 50 berths of the inaugural season). The long 2010 Pro season gets under way at the start of next season, which takes place during May. I’m currently ranked in somewhere in the top 90 so it’s looking very likely that I’ll be racing in the next Pro series. The second event of the iRacing World Tour 2010 was a ‘virtual Daytona 500′, held the day before the Sprint Cup start their 2010 season with the real Daytona 500. I joined the race despite the very late start for me (midnight) and it was a pretty cool event. Some 1344 racers turned up to form 32 race splits, which actually was a little bit lower than I expected. The race itself was pretty tough though, but pretty much exactly as I expected. 42 cars in my split meant cautions every couple of laps, and also plenty of incidents along the way as the race unfolded. I got caught up in a big wreck on lap 20 or so and had to use up my reset, but even so the wrecks (and incidents) continued. Eventually my race had to end due to another wreck on lap 131 of 200 (after over three hours of racing!) but it was still a pretty cool experience. Due to the race length I picked up a new record for incidents in a race but that’s to be expected I guess so I’m not too bothered about it. I would have hoped for less cautions in the race but that’s the byproduct of having 42 cars at Daytona, racing online. I finished 14th in my split, and saw my oval iRating increase to a new high point of 2501. Celtic Crash Out Of The World Cup! In a closely fought competition, Club Celtic were beaten in the regional finals of iRacing’s first annual World Cup by the winning club England. France took a distant third place in the final standings. We took a narrow lead after the second of the four events, but some poor results in the final two races saw us lose out with 101 points to Englands 139. I had a great race in my race (I raced in one of the four events) and set a new high watermark for a points finish – 205 points for a third place finish. It’s a shame to lose out on making the final but it was a pleasure to take part and it was surprising how competitive it got when the stakes were so high! The World Cup final will be held next Saturday between England and six other clubs who will all register five drivers to share the track and duke it out all at once. Winner takes all! The race will be broadcast so I’m looking forward to watching and seeing it all unfold.